1. 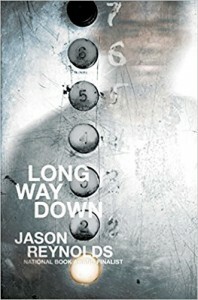 I have recently finished my book Long Way Down by Jason Reynolds. I thought that it was a really good book. I learned a lot from it. I thought that Reynolds did a really good job because he made the novel very captivating. 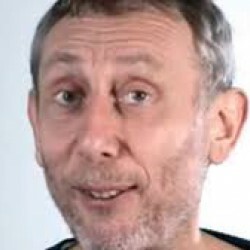 Whenever a new character comes on, the previous person lights a cigarette until the point where Will says that he is suffocating. This was a very vivid memory I have about this book. 2.My buddy, Jaiden read Ghost by the same author and we compared the way that our books were written. We both agreed that our author likes to write about city-life. Ghost and Long Way Down are both set in the city and they both focus on the emotions of the main character. 3.On Booklikes, you can find new books to read. I have found Return to Planet Tad by Tim Carvell by using this website. In order to find a new book, you go to your "Dashboard," and then type your favorite author into the top right box. After this, you can see all of the books that this author has written. You can always get a book that you like by using this method. ""And then there were shots. Everybody ran, ducked, hid, tucked themselves tight. Did what we've all been trained to do."" In this quote, Jason Reynolds shows that shootings are a normal thing to hear where Will, the main character lives. This is a pretty powerful quote because Will seems to not be very afraid in his description until he learns that it his own brother who is shot. It kind of seems like a mundane thing to happen when he describes it. This quote can speak for the whole book as I have never read anything more brutal than Long Way Down. None of the WWII books that I have read are close to this one in brutality. This is because this book is filled with emotions and you can feel what the characters are feeling. You feel bad for Will, but you do not want to see him killing the person who he thinks killed his brother because you know hat it would not be right for him to kill that person. If he will, you are pretty sure he will get caught. The whole book is very realistic and I like this because I have never read a book like it before. Jason Reynolds moved to Brooklyn, New York when he first started his writing career. This heavily influenced his writing style. He mainly writes about black culture in cities. Long Way Down is about Will, a kid who wants to avenge his brother's death by killing the guy who killed his brother. In certain neighborhoods, shootings happen a lot. In New York City, this happens sometimes.. Jason Reynolds does a very good job at explaining this, especially if you do not know a lot about this type of thing. Hey, I'm Ty Laughlin from Riverview Jr./Sr. High School. I am really into fantasy and realistic fiction. I really tend to gravitate to WWII books. Those are my favorites. Although it is nonfiction, one of my favorite books from the WWII topic is Unbroken by Laura Hillenbrand. Unbroken is about a former Olympian who is drafted into WWII. He then crashes in the Pacific Ocean and is taken by Japanese soldiers to multiple concentration camps. Louis (the main character) just tells his tough story of the struggle through WWII. 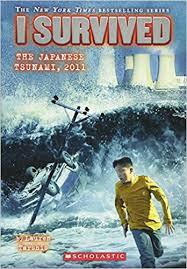 The novel that I am currently reading is I Survived: The Japanese Tsunami. I know, it seems a little bit below my grade level, but it is a good book. I have kind of just started the book, so I cannot really say that, but it is better than I already though it would be. The main character, Ben, is visiting his Japanese Uncle's house in Japan. There is obviously a tsunami coming, but I do not know if Ben will survive. I can still probably predict that Ben will survive because this series does not really seem like the type of novel that would have the main character die. Right now, the author's style has not really been reveals as I am only 17 pages into the book. I can say that the transition from the first chapter into the second stood out to me greatly. In the first chapter, they revealed the climax of the book by talking about the tsunami, and how it "made Ben feel as if he was getting wrestled by the water, and beaten badly." (Tarshis 3). This really stood out to me because I thought that ruined a little bit of the book for me. It took the thrill of the climax away. I hope it does not ruin the whole book though. So far, I think that this book will be okay, except for that little part that I mentioned at the end. I can't wait to finish it!